CFL-605RT is compact but provides a wide range of functions including eccentric, tangential, and reciprocating cuttings and creasing. Ideal for package mockup production and small-lot package production. Cushioning for packaging can also be cut with CFL-605RT. Thick materials are neatly cut by a vertical reciprocating motion. The reciprocating cutter is capable of cutting materials of up to 10-mm thickness. ■Maximum vertical vibration rate: 3,000 reciprocating motions/min. The blade is able to cut not only thick materials up to 2 mm but also thin films by controlling low and high downforce pressures precisely. The blade edge is automatically and precisely controlled along contour cutting lines specified by the software. It is good for cardboard and foam board. Coated cardboard, reflective vinyl, rubber sheets, industrial materials, and F/G flute cardboard. 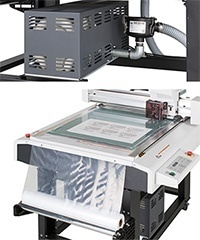 The versatile CFL-605RT plotter is capable of cutting and creasing. It can be used on paper, PET as well as film. Materials are properly cut with an optimal downforce setting from 30 and 1,000 g for optimum cutting. The roller creases materials and enables the creation of a perfect package. Downforce pressures are adjustable from 500 to 1,500 g depending on the material. A sensor reads register marks on the material for precise cutting. Depending on application, different tools for each unit can be switched in for optimum cutting. *Tools need to be switched manually by users. A vacuum suction system reduces lifting of material during operation by holding the material in place. Lightweight or thin materials tend to move or lift during cutting; therefore, CFL-605RT offers a combination of features to prevent this problem. A compact built-in vacuum unit holds the material in place during reciprocate cutting. An adsorption sheet (SPC-0787) put on top of the material to be cut enhances vacuum suction by reducing air flow through the material, and the adsorption sheet is easily unrolled from the left side of machine. *Please place felt mat 605 (SPC-0785) on the cutting table during reciprocate cutting. *Please tape four corners of any material that cannot be held securely by the vacuum unit. * An adsorption sheet (SPC-0787) is sold separately. Easy mock-up production in combination with UV inkjet printer! Conventionally, there are many work processes involved in creating packaging for a product. You might ask an outside contractor to create the package; however, it would take longer to complete the work because of misunderstandings, distance, time differences, etc. The combination of CFL-605RT and UJF-6042MkII* offers a total solution, not only for printing on a product but also for the design and creation of product cushioning and packaging. This combination delivers effective high-mix low-volume production and significantly shortens the lead time for prototype creation and small-lot production by on-demand fabrication. What is the flatbed printer UJF-6042MkII? UJF-6042MkII is a LED UV curing inkjet printer capable of printing on objects as well as on packaging materials up to A2 size.